I've made Pork Sisig a number of times already, but I always failed to take pictures. Either I didn't have time before I leave for the party that I had to bring it to or I was too excited to eat it to find time for a photo shoot. Though I love pork sisig, it's something I don't make on a regular basis mainly because of how wicked this dish is and also because of all the chopping involved. Thanks to this month's Kulinarya Cooking Club Challenge hosts, Jenn of Storm In My Kitchen and Frances of ISKAndals.com, I had the reason to make sisig again! And because I didn't have to bring it somewhere, I had time to take some photos to share with you before it was all gone! 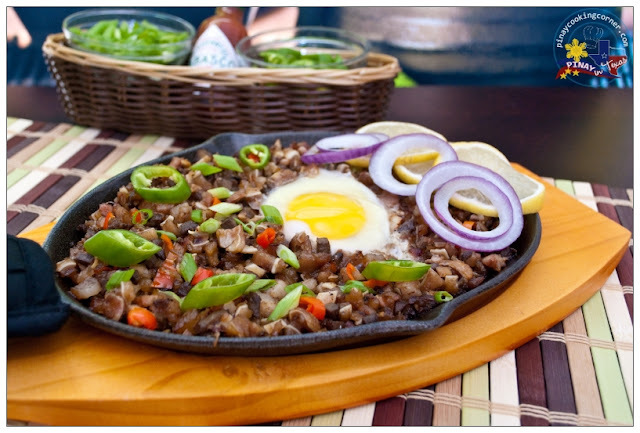 For those of you who don't know what Sisig is, it is an appetizer which is traditionally made from pig's cheeks, ears and liver and has become every Filipino's favorite accompaniment for beer and other alcoholic beverages. For many, it is also a very appetizing dish to go with rice. According to our friend wiki, it originated from the province of Pampanga where the word sisig means "to snack on something sour", and is now used to refer to any dish made from chopped seafood or meat (like chicken and pork) seasoned with vinegar, calamansi juice, chopped onions and served in hot plates. 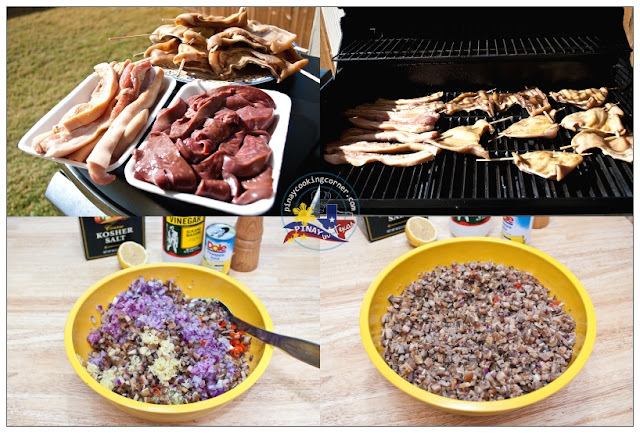 Pork Sisig is the original and most popular version of sisig, and because of its popularity, several versions like chicken, tuna, bangus(milkfish), tahong(mussels), tokwa't baboy (tofu and pork) and mixed seafood have emerged. 1. Clean pig ears, pork belly and liver in running water. Be sure to scrape remaining hair. Drain. Slice liver into 1/2 inch cuts. 2. In a bowl, combine 1/4 cup soy sauce, 2 Tbsp lemon juice, minced garlic and 1/4 tsp ground black pepper. Marinate pork belly for at least 1 hour. 3. 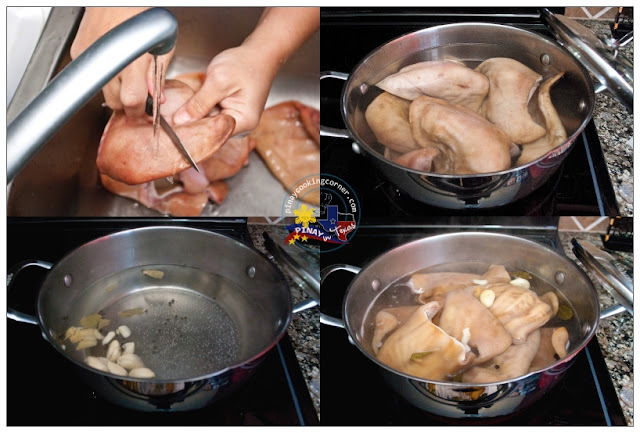 Place pig ears in a pot. Add enough water to cover them and bring to a boil over medium heat for 10 minutes. (This will help remove the gamy smell.) Drain. Replace water and bring to a boil. Add crushed garlic, crushed ginger, bay leaf, peppercorns and about 1 Tbsp salt. Simmer for about 30 minutes. 4. Grill pork belly, ears and liver over medium heat for about 20 minutes or until everything is crisp and browned. Mash about 4 slices of grilled liver using a food processor. 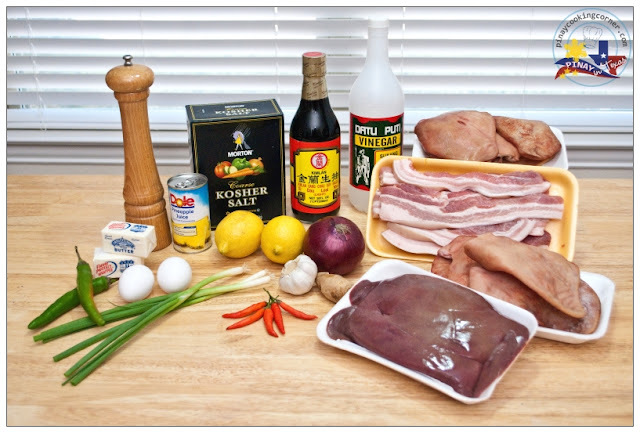 Chop the grilled pork belly, remaining liver and pig ears finely, then combine them with 1 Tbsp minced garlic, onion, ginger, Thai pepper, vinegar, 1/4 cup lemon juice, 1/4 cup pineapple juice, 2 Tbsp soy sauce, 1 tsp. salt and 1/4 tsp black pepper and the mashed liver. Mix until well incorporated. Let sit in the refrigerator for at least 1 hour before serving. 5. To serve, melt butter in a skillet over medium heat. Add the mixture and stir for about 5 minutes. Transfer to a sizzling plate and break 1 egg on top. Top with anaheim pepper and green onions. Serve with lemon or calamansi on the side. This looks amazing. Light and flavorful but without all the fuss. You always amaze me with what you come up with! YUM! Grilled meat have always great flavor, you cook great traditional dishes. Oohhh, I love Sisig and yours looks very traditional Filipino style - Beautiful! Love to have this with cold San Miguel hehe. Have a Happy Thanksgiving to you and your family, Tina! God bless! What a mouthful of flavors! The meats are different than what I'm use to, but the combination looks interesting especially with the ginger, the garlic and the pineapple juice, and of course the spicy! Great appetizer and even main dish! Hope you and your family have a wonderful Thanksgiving! Nothing beats the authentic flavor of real fire. Your sisig looks exactly like the serving I love during my archi uni days! I love the presentation of your sisig,Tina!! So mouthwatering! 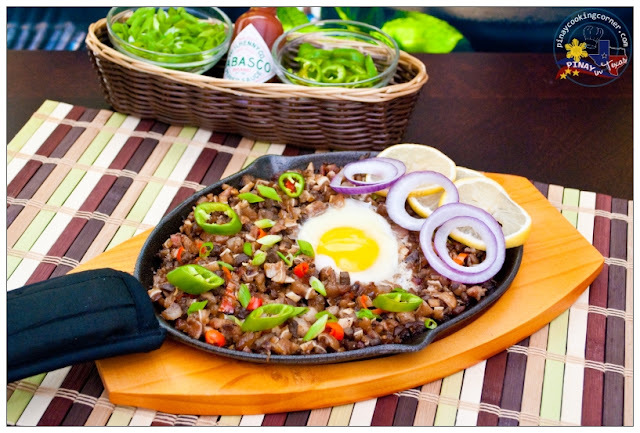 Your classic sisig looks so delicious! Great job! I love what you put in your sisg -- pineapple juice and butter. :) I am drooling. There are so many versions that I am wanting to try, this one included. Thanks! Hi Tina, this dish look interesting no doubt I only like the liver. Love the pineapple juice combination. Lovely presentation.